The Acolyte ministry at St. Francis exists to serve God by assisting the priest during worship and to facilitate the flow of the service. This ministry is open to everyone age seven and up. If you feel called to share and serve in this ministry, please contact us. The Altar Guild is a ministry of love that serves God by preparing and tending our place of worship and preparing the altar for Holy Eucharist. We welcome all who might be interested in serving in this very rewarding ministry. The choir consists of adults who love to sing and are willing to assist in the leading of singing during our worship. Practices are held each Sunday at 9:00 a.m. in the parish hall music room. This group prepares the flower arrangements used at the altar for services. We welcome all who might be interested in joining our group. Lay Eucharistic Ministers lead the Prayers of the People, serve at the altar in worship, and assist the priest by administering the Chalice during Holy Eucharist. Being bearers of the Blood of Christ, theirs is a servant ministry devoted to Christ Who is in our midst. This ministry is open to confirmed communicants in good standing. It also requires licensing through the Diocese of West Texas, and regular training by the priest in charge of the parish. Lay Eucharistic Visitors minister to the sick and “shut-in” by bringing Holy Communion from the Sunday Eucharistic Celebration straight to them. This ministry is comprised of Lay Eucharistic Ministers who have received further training. and is open to confirmed communicants in good standing. It requires licensing through the Diocese of West Texas. Lectors are ministers of the Word of God written who proclaim the Scriptures from the Old Testament, Epistles, and Psalms in worship. This ministry is open to communicants in good standing who are regularly trained by the priest in charge of the parish. 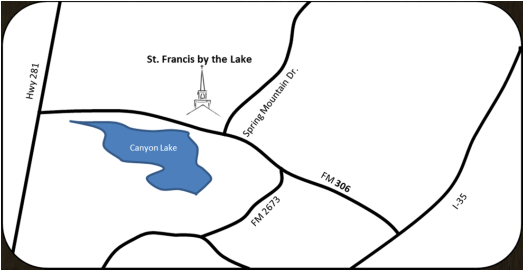 St. Francis by the Lake has a fully staffed nursery to care for your young children. Children are provided a safe and fun environment with Christian songs and stories.